To highlight variation in Internet access according to individual consumer characteristics. See www.mori.com/technology/techtracker.shtml for up-to-date data on demographics in the UK. 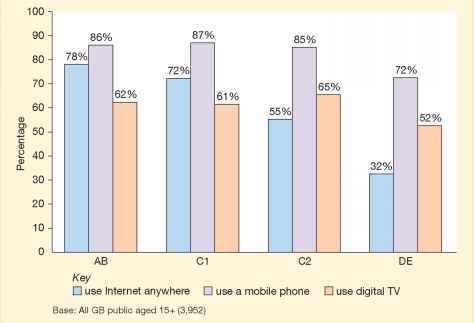 1 Refer to Figure 2.19 opposite, which is typical for most countries with Internet use at more than 50% of the population. What differences are there in the demographics compared to those for the national population? 2 Now refer to Figure 2.20. Summarise the variation in different access platforms for digital media across different social groups. Attempt to explain this variation and suggest its implications for marketers. • Usage location. In most countries, many users access either from home or from work, with home being the more common location. Work access places constraints on Internet marketers since firewalls will not permit some plug-ins or rich e-mail to be accepted. • Access device. For example, browser type, screen resolution and computer platform (available from web analytics services as described in Chapter 9), digital TV or mobile phone access. • Connection speed - dial-up or different choice of broadband speed. • ISP - a portal-based ISP such as AOL or Wanadoo, or an ISP which does not provide any additional content. • Experience level - length of time using the web and their familiarity with online purchase. • Usage type - mode of usage, for example, work, social, entertainment. • Usage level - frequency of use and length of sessions giving total usage level in minutes per month.